We would love to hear from you! If you need to contact us with any question, feedback, testimonials, suggestions or issues then please send us an email at orders@oamarupharmacy.com or give us a call on 0800 000 980 in New Zealand Business Hours. We endevour to reply to your email within 24 - 48 hours except during the weekends or holidays. Call: If you need customer service contact our Customer Service team or if you need a pharmacist call 0800 000 980 if your are based in New Zealand or call 006434348741 If you are overseas. Email orders@oamarupharmacy.com or use the contact form below. The products you need shipped to your door fast! Our 7.50 New Zealand shipping is cheaper then parking in Central Auckland. 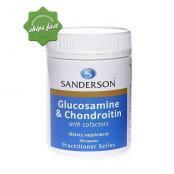 Glucosamine and Chondroitin may Assist in maintaining joint comfort and mobility during the ageing process when levels of these important nutrients are known to decline, a common cause of joint degeneration.